Caprice is a disco project from Jacques Fred Petrus (Macho, Revanche, Peter Jacques Band, Change) and Candelario Sanchez. One of the last Euro-disco productions on the Italian disco label, Goody Music. The album is one of the rare and underground finds of the Jacques Fred Petrus collection and one of the sounds of the orchestrations which were assembled by Petrus. 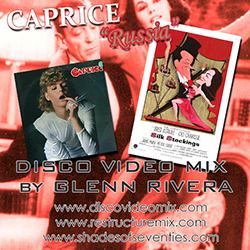 “Russia” is a track from the project which I have created a Disco Video Mix using the 1957 musical/comedy/romance film, “Silk Stockings” starring Fred Astaire and Cyd Charisse. The remake of “Ninotchka” gives a few dance sequences with Russian flavor a great pairing with this disco piece. Featuring scenes from “Silk Stockings” – RENT THE DVD!